Touring DC on bike gives you the opportunity to explore DC’s iconic monuments and museums in a personable and approachable way. With your own personal guide, you can relax, enjoy the city's sites so much more and watch history come to life! Adults and children of all ages can enjoy riding bikes together; smaller children may be chauffeured safely by the nationally known bicycle safety expert in his custom family bike to carry children ages 2 to 10 and/or on a tag-along. 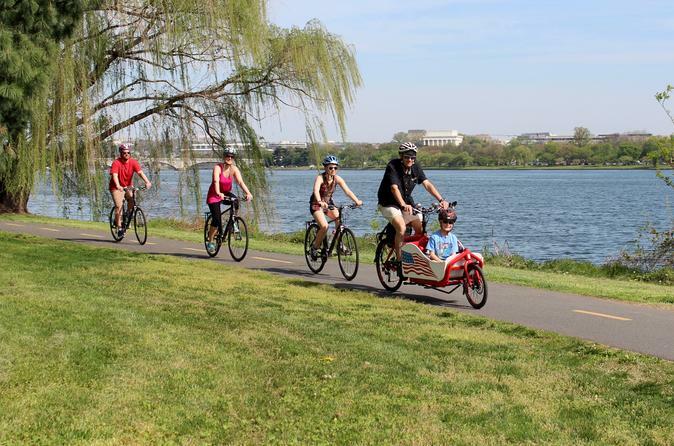 Explore DC by bike with your family! Your ride will be customized to family-friendly sights while traveling the safest routes so you can focus on enjoying the experience. Having explored DC with children of his own, your personal guide will take you to kid-friendly sights and/or point out additional attractions to explore further if you have extra time. The tour is customized to your family's wishes. Some of the more kid-friendly routes and sites include several parks and places like the White House, Washington Monument, National Mall, and Lincoln Memorial. Your route may also include a Smithsonian Museum with kid play area stops, splash parks or other iconic sites including the Jefferson Memorial, MLK Memorial, Smithsonian Castle, Capitol Building, Supreme Court, or Rock Creek Park. Your guide will provide premium water bottles for each of your family members to keep, a wide selection of healthy and kid friendly snacks, and he will be able to carry most (if not all) of your gear so that you can focus on riding and enjoying the sights.